It's difficult to try to achieve a personal dream if you are married with children and it's even more difficult when you are in your 50s and don't have the support of your husband or your sons. But with a lot of hard work and perseverance, personal dreams can be reached no matter how old you are. Abbie Rose Stone is 54 years old. Her husband likes his life in Ann Arbor, Michigan, and only visits their cabin near Traverse City when it suits his schedule. Their three sons are scattered all over and rarely get home. Abby prefers the quiet of the cabin on the shore of Lake Michigan and goes there to revive her soul and help get her bearings in her life. 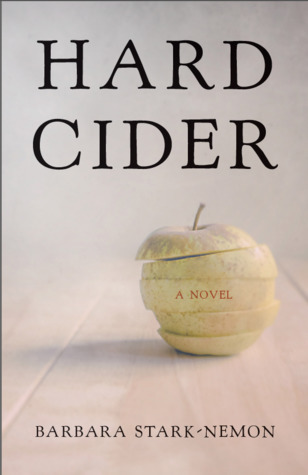 She has always had a dream to have her own business and has decided that she wants to start a business that makes hard cider from the plentiful apples in the area. Her husband and sons are skeptical but she forges ahead with her plans. Just when things are starting to look positive for her, several major things happen in her family that cause family turmoil and may make her dream impossible to reach. This is a wonderful story about family and love and reaching your dreams no matter what your age. I absolutely loved Abbie Rose and she was so well written that I feel like I could sit down and have a cup of coffee with her. This was a special book to me because I am familiar with the area that the book is set in and think that the shore of Lake Michigan is the most beautiful place in the world. That said, you don't need to be familiar with the area to enjoy the beauty of the scenery that the author provides. This is my first book by Barbara Stark-Nemon but I enjoyed this one so much that I just ordered her early book - Even in Darkness. Your book this week looks fantastic. I love books about Paris. I haven't heard of this one but, I think I'd try this one. Hope you are enjoying it. Sounds good. I haven't heard of the book before but then, it isn't the sort of thing I usually read. This week I have The Hollow of Fear by Sherry Thomas from my review stack. Happy reading! This sounds rather interesting. I'd give it a try. I love stories about reaching for your dreams...and the setting of this one sounds wonderful. Thanks for sharing, and for visiting my blog. This book definitely fits your criteria - the main character has a dream and fits the odds to try to make it work out. Thanks for your comment. It's almost 90 in NC today - hard to believe fall will ever get here. Thanks for your comment. I'd read on to learn more about the relationship between the narrator and Alex. Great pick, glad you liked it! Here's my Tuesday post - thanks for sharing! I haven't heard of this author but I do like that premise! Love a good story about pursuing your dreams!